SanDisk Corporation (NASDAQ:SNDK), a global leader in flash storage solutions, today announced the availability of the SanDisk(R) X300 SSD. The SanDisk X300 SSD leverages the latest advancements in X3 technology to deliver a great user experience with high-performance, while utilizing robust error-correction to increase reliability and provide peace of mind for today’s CIOs. SanDisk’s new client SSD also includes an improved SSD Dashboard, which provides visibility into the drive’s performance, security, and available firmware updates, in order to maintain peak performance at all times-an important feature for today’s mobile workforce. The X300 utilizes SanDisk’s advanced 1Ynm X3 flash technology, and incorporates nCache 2.0 technology, a next generation tiered caching technology that combines SLC and X3/TLC flash blocks to improve endurance, increase efficiency, and boost performance in corporate workloads such as office productivity applications, media creation or financial transactions. To improve the reliability of the drive and maximize end-to-end data integrity, the X300 SSD also includes a robust error handling mechanism that utilizes XOR recovery technology to implement an extra layer of data protection. The SanDisk X300 SSD includes a downloadable SanDisk SSD Dashboard application, which provides management tools such as drive performance and health monitoring, manual or scheduled TRIM, notifications for firmware updates, and tips on how to maintain the drive at its peak operation. Additionally, the SSD Dashboard includes a broad array of useful embedded applications including the Apricorn EZ Gig IV cloning software, which provides the ability to create an exact replica of an old hard drive onto the new SanDisk X300 SSD in three easy steps. With Apricorn’s EZ Gig IV cloning software, there is no need to re-install the operating system, programs or settings-making it easy for mobile employees to get up and running quickly after an upgrade or crash. 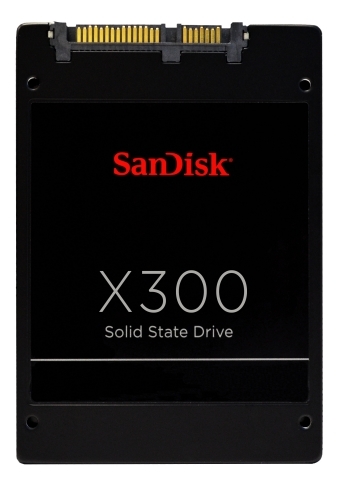 The SanDisk X300 SSD is highly versatile and can accommodate a wide range of computing platforms. It will be available in October in capacities of 128GB, 256GB, 512GB and 1TB* (2.5″ only). To learn more about and experience a demo of the X300 with enhanced SanDisk SSD dashboard, please visit SanDisk in booth #242 during Interop New York, taking place at the Jacob Javits Convention Center, or visit http://www.sandisk.com/products/ssd/sata/x300/. Interop(R) is the leading independent technology conference and expo series designed to inform and inspire the world’s IT community. Part of UBM Tech’s family of global brands, Interop(R) drives the adoption of technology, providing knowledge and insight to help IT and corporate decision-makers achieve business success. Through in-depth educational programs, workshops, real-world demonstrations and live technology implementations in its unique InteropNet program, Interop provides the forum for the most powerful innovations and solutions the industry has to offer. Interop Las Vegas is the flagship event held each spring, with Interop New York held each fall, with annual international events in India, London and Tokyo, all produced by UBM Tech and partners. For more information about these events, visit www.interop.com. (c) 2014 SanDisk Corporation. All rights reserved. SanDisk is a trademark of SanDisk Corporation, registered in the United States and other countries. nCache is a trademark of SanDisk Corporation. Other brand names mentioned herein are for identification purposes only and may be the trademarks of their respective holder(s).